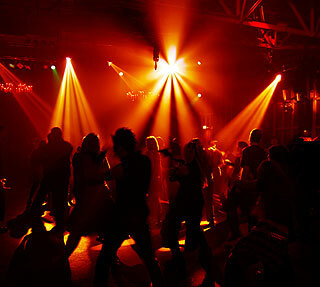 Are you looking for high-caliber nightlife? Cabo San Lucas is legendary for its party scene, from mellow venues for enjoying a sophisticated cocktail to energetic late-night dance parties, Cabo San Lucas has a deserved reputation for hard-rocking. Historic San José del Cabo is quieter, but also offers some great choices for nighttime fun. Whatever your flavor of nightlife, you'll find it in Los Cabos. Amazing Cabo Bar Crawl An "Amazing Race" inspired bar crawl, this experience combines team challenges, puzzles and multiple stops at the area's best watering holes. Rooftop at Cabo Villas Beach Resort in Cabo San Lucas, and second location on the marina. Casual local brewery with pub fare, live music and great beer. Médano Beach. The beach party never ends at this great people-watching spot on the sand. Mexican food, happy hour and great views. Blue Marlin Ibiza Located at the ME Cabo Resort, this incredibly stylish poolside club offers a day beach club, themed parties, and celebrity DJs. Cabo Blue Bar 3 Blvd. Marina #30, 143-7323. This small, friendly outdoor bar offers sports TV, live music on some nights and pub fare. Vicente Guerrero and Lázaro Cárdenas, 143-1188. 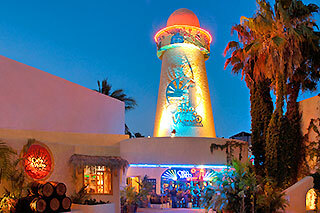 Sammy Hagar´s landmark cantina featuring plenty of rock and roll and the signature Cabo Wabo tequila. Blvd. Marina & Matamoros, 143-0606. Get hoisted up on the trophy wall like a marlin! Risqué floor show and plenty of laughs. La Vaquita Blvd. Marina near the corner of Zaragoza. Dance all night at this popular, stylish club that keeps the party going. Lázaro Cárdenas between Morelos & Zaragoza, 143-2054. Very stylish scene, energetic dancefloor and upper floor "beach club" with sand and palms. Plaza Bonita, Blvd. Marina #17, 143-4493. The happy hour packs ‘em in and late nights get pretty wild. Dance floor and DJ. Playa El Médano, 143-3464. Known for on-the-sand dining. A fantastic spot for happy hour and people watching. Famous 16-ounce margaritas. Located at The Cape, a Thompson Hotel Km. 5. Incredible sunsets can be enjoyed at this glamorous rooftop lounge that offers incredible style, designer mixology and glorious views of the coast. Don't miss it! Sangria's Blvd. Marina at the corner of. M. Matamoros, downtown Cabo San Lucas next door to Giggling Marlin. This cozy small bar is a friendly stop for cold drinks. Blvd. Marina, Interior Plaza Mariachis. This one-of-a-kind spot calls itself “The World’s Smallest Bar”with just four stools, tequila (no mixers) and beer. Blvd. Marina across from Plaza Bonita, 143-0655. A Cabo icon. Three floors of totally outrageous, wild and crazy fun. Gets quite crowded. Corner of Niños Heroes and Zaragoza, 624-144-3441. Come for the great selection of mezcals at this fun-filled bar. Transp. Hwy. Km. 5.5 at Sunset da Mona Lisa, Misiones del Cabo, 145-8160. Lively scene at this wine bar with gorgeous views. Tapas and live music. Omnia at the Vidanta Resort in San José del Cabo. One of the hottest new spot to have opened in Los Cabos, Omnia is a stylish beachfront day club and lounge with big name DJs and theme parties. Rock & Brews Paseo Malecon, Local 1, San Jose del Cabo. Come for the cold beer, great pub fare and classic rock. Blvd. Mijares #30, 142-1580. Live Latin bands Friday and Saturday nights. Popular happy hour.